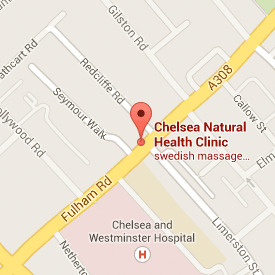 works in Chelsea at Chelsea Natural Health Clinic, Fulham Rd, SW10. Shiatsu, like most traditional Oriental medical practices, is a complementary therapy, similar to an eastern version of Osteopathy. Shiatsu includes techniques from massage, physiotherapy, acupressure and stretches to open the body to create a stronger you. It’s incredible how touch can be so powerful and almost immediately strengthen the body’s physical, emotional, psychological and energetic systems. I absolutely love my work and also offer Auricular and Facial Acupuncture to further reduce any pain/syndromes that are providing you with dis-ease. Book a course of treatments now, get more from all the energy you invest in life. Receive regular treatments as a new way of life. As a committed professional who aspires to only the highest quality of care, I have only limited availability each month. Are you committed to improving the quality of your life and prepared to work at this? Yes? Then I would be honoured to work with you.